During Biomass Magazine's third installment in its free webinar series, four presenters described how their respective colleges and universities successfully implemented a biomass solution into their campus energy portfolio. Columbia (Mo.) Water and Light has approval from its advisory board to purchase corn stover pellets for trial burns at the municipal power plant this winter. Last year the company performed a test burn with miscanthus pellets. Flagship VentureLabs has announced that Midori Renewables is globally deploying their trademarked Breaking the Biomass Barrier technology, a novel catalyst that melts non-food biomass into low-cost sugar. The U.S. EPA has released renewable identification number (RIN) data for July, showing that 56,460 D3 cellulosic biofuel and 44,253 D7 cellulosic diesel RINs were generated during the month. 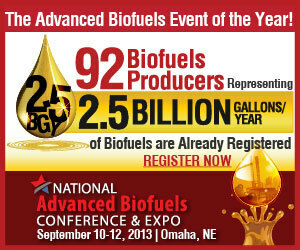 Advanced biofuel production was also up. British Columbia-based pellet producer Viridis Energy Inc. has announced its wholly owned subsidiary Scotia Atlantic Biomass Co. Ltd. has commenced operations and is producing wood pellets at its 120,000-ton-per-year plant in Nova Scotia. The Pellet Fuels Institute recently announced the addition of two new companies to its pellet fuel standards program. Curran Renewable Energy and American Wood Fibers have officially qualified under the certification program. The Pacific Institute for Climate Solutions has announced a new online calculator tool designed to help rural communities in British Columbia, Canada, determine if debris from wildfire prevention activities can serve as bioenergy feedstock. DP CleanTech has announced the continuation of its successful relationship with China Chant Group, with the commencement of work in August for the fourth biomass power plant to be delivered to Chant by DPCT. RenuEn Corp.has announced the signing of a significant five-year agreement to purchase 3,750,000 gas gallon equivalent (GGE) from its St. Cloud compressed natural gas (CNG) facility, a landfill gas project. FSE Energy is pleased to announce the opening of a new state-of-the-art 135,370 square foot manufacturing facility in Dallas, Texas. This site is the second fabrication facility for FSE Energy; the first is located in Vacherie, La. Brazil-based CPFL Renewable Energy SA recently announced that its biomass power plant in Sao Carlos Ivai, Parana, Brazil, is now operational. According to the company, the Thermoelectric Plant Biomass Coopcana Movida has a 50 MW capacity. Eagle Valley Eco Fuel Inc. has earned the USDA certified biobased product label for its Brickenmore biomass fuel brick and fire starters. The label verifies that the products amount of renewable biobased ingredients meets USDA standards. Green Dot Holdings LLC is manufacturing bioplastic resins made from a MCG BioComposites' proprietary blend of corncob fiber and post-consumer recycled (PCR) or post-industrial recycled (PIR) plastic. The Algae Biomass Organization and the Algae Industry Incubation Consortium, Japan, announced today a cooperative effort to share algae industry best practices and expertise that is commencing at the International Symposium on Algal Biomass. Roughly 500 participants tuned into Biomass Magazine's webinar on Aug. 29 to learn how anaerobic digesters are being incorporated into U.S. college campuses. The event was sponsored by SeaHold and Team Biogas. Technological breakthroughs and the expansion of international trade in biomass pellets are expected to lead to sustained growth in the biomass power sector, with worldwide revenue reaching $11.5 billion annually, according to Navigant Research.